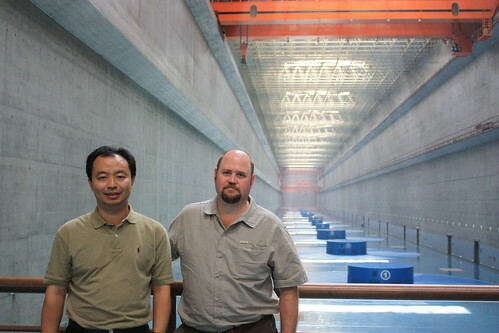 Zhiqun (Daniel) Deng (l) and Rich Brown in the Three Gorges Dam in China. 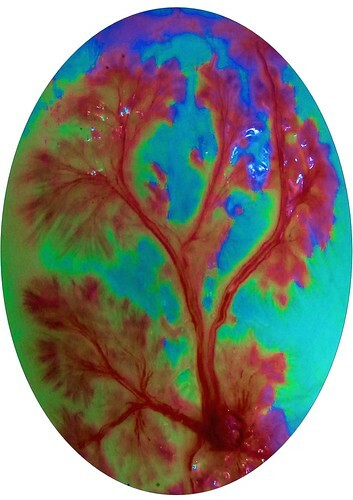 Colorized photo of the swim bladder of a smallmouth bass. 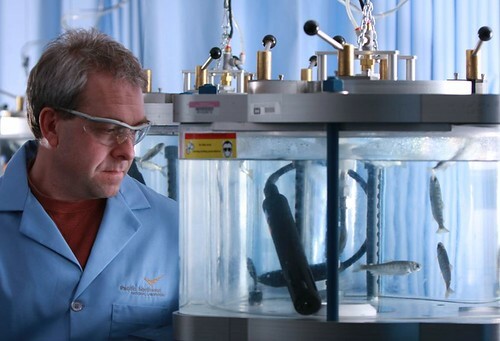 Researcher John Stephenson observes young salmon in a chamber used to simulate the conditions that fish sometimes experience as they travel through a dam. RICHLAND, Wash. — Think of the pressure change you feel when an elevator zips you up multiple floors in a tall building. Imagine how you'd feel if that elevator carried you all the way up to the top of Mt. Everest — in the blink of an eye. That's similar to what many fish experience when they travel through the turbulent waters near a dam. For some, the change in pressure is simply too big, too fast, and they die or are seriously injured. 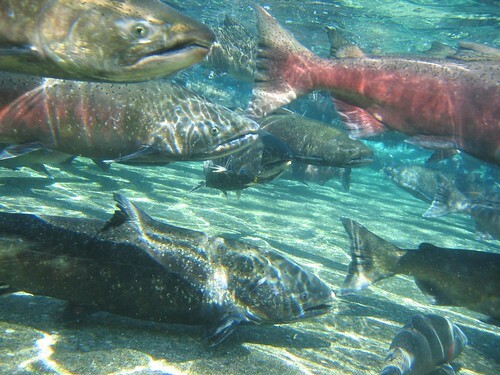 In an article in the March issue of the journal Fisheries, ecologists from the Department of Energy's Pacific Northwest National Laboratory and colleagues from around the world explore ways to protect fish from the phenomenon, known as barotrauma. PNNL researchers are working with officials and scientists from Laos, Brazil, and Australia — areas where hydropower is booming — to apply lessons learned from experience in the Pacific Northwest, where salmon is king and water provides about two-thirds of the region's power. There, billions of dollars have been spent since 1950 to save salmon endangered largely by the environmental impact of hydropower. "Hydropower is a tremendous resource, often available in areas far from other sources of power, and critical to the future of many people around the globe," said Richard Brown, a senior research scientist at PNNL and the lead author of the Fisheries paper. "We want to help minimize the risk to fish while making it possible to bring power to schools, hospitals, and areas that desperately need it," added Brown. Harnessing the power of water flowing downhill to spin turbines is the most convenient energy source in many parts of the world, and it's a clean, renewable source of energy to boot. "To customize a power plant that is the safest for the fish, you must understand the species of fish in that particular river, their physiology, and the depth at which they normally reside, as well as the tremendous forces that the fish can be subjected to," said Brown. PNNL scientists have found that trying to keep minimum pressure higher in all areas near the turbine is key for preventing barotrauma. That reduces the amount of pressure change a fish is exposed to and is a crucial component for any turbine that is truly "fish friendly." Preventing those extremely low pressures also protects a turbine from damage, reducing shutdowns and costly repairs. The scientists estimate that the region's fish account for almost half of the protein in the diet of the people of Laos and nearly 80 percent for the people of Cambodia. Four out of five households in the region rely heavily on fish for food, jobs, or both. "Many people in Southeast Asia rely on fish both for food and their livelihood; it's a huge issue, crucial in the lives of many people. Hydropower is also a critical resource in the region," said Deng, a PNNL chief scientist and an author of the paper. "Can we reduce the impact of dams on fish, to create a sustainable hydropower system and ensure the food supply and livelihoods of people in these regions? Can others learn from our experiences in the Pacific Northwest? This is why we do research in the laboratory — to make an impact in the real world, on people's lives," added Deng. The same team of scientists just published a paper in the Journal of Renewable and Sustainable Energy, focusing broadly on creating sustainable hydro in the Lower Mekong River Basin. The paper discusses the potential for hydropower sources in the region (30 gigawatts), migratory patterns of its fish, the importance of fish-friendly technology, and further studies needed to understand hydro's impact on fish of the Mekong. Authors of the Fisheries paper include scientists from PNNL, the National University of Laos, and the Living Aquatic Resources Research Center in Laos, the Federal University of São João Del-Rei in Brazil, the University of British Columbia; and from Australia, the Port Stephens Fisheries Institute in New South Wales, the Narrandera Fisheries Centre in New South Wales, and Fishway Consulting Services. PNNL's work in the area has been funded by the U.S. Army Corps of Engineers, DOE's Office of Energy Efficiency and Renewable Energy, and AusAid, the Australian Agency for International Development. Reference: Richard S. Brown, Alison H. Colotelo, Brett D. Pflugrath, Craig A. Boys, Lee J. Baumgartner, Z. Daniel Deng, Luiz G.M. Silva, Colin J. Brauner, Martin Mallen-Cooper, Oudom Phonekhampeng, Garry Thorncraft, Douangkham Singhanouvong, Understanding barotrauma in fish passing hydro structures: a global strategy for sustainable development of water resources, Fisheries, March 2014, DOI:10.1080/03632415.2014.883570.